Kirsten Hammarstrom hasn't been home to her tiny corner of rural Wisconsin in years-not since the mysterious disappearance of a local teenage girl rocked the town and shattered her family. Kirsten was just nine years old when Stacy Lemke went missing, and the last person to see her alive was her boyfriend, Johnny-the high school wrestling star and Kirsten's older brother. No one knows what to believe-not even those closest to Johnny-but the event unhinges the quiet farming community and pins Kirsten's family beneath the crushing weight of suspicion. Now, years later, a new tragedy forces Kirsten and her siblings to return home, where they must confront the devastating event that shifted the trajectory of their lives. Tautly written and beautifully evocative, The Mourning Hours is a gripping portrayal of a family straining against extraordinary pressure, and a powerful tale of loyalty, betrayal and forgiveness. Don't you just love a book that you can't put down? The Mourning Hours was one such book for this reader. First, this tale is set in Wisconsin. I happen to be a very proud Wisconsinite and I'm always thrilled when my home state is featured in a book. 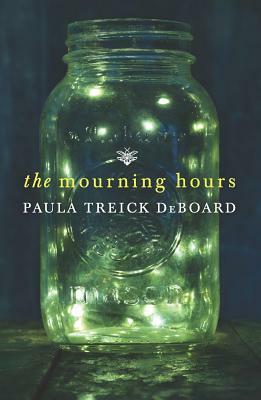 The Mourning Hours depicted the small town feel of rural Wisconsin life very accurately. Second, the suspense was done remarkably well. DeBoard reeled me in deliberately and thoroughly. The events of one snowy evening changed the Hammarstrom family forever and I found myself racing through the pages to find out exactly what happened. I heartily urge you to read this tightly woven story. You won't be disappointed. Thanks to Erin at Quixotic Magpie for recommending this book. I'm endlessly obliged! I love midwestern books that AREN'T set in Chicago. I mean, I love the Chicago ones too, but like, Neil Gaiman's American Gods traveled through Illinois south of I-80 and I was like "I know that place! And that one! Yay!" This book sounds like a great story- you're killing my TBR list! Sounds really good, indeed! And the cover is beautiful. By the way, one of my friends is studying in Wisconsin this year! I think she doesn't want to come back, as the economic situation in Spain is a mess and young people can't work (I am a vet and a secondary school teacher and I can't find a job, can you imagine?). The economy is rough all over :( I hope you're able to find a job soon Isi!! I honestly thought the same thing Monika! I'll be lame right along with you. I probably never would have done more than glance at this one if not for Erin's recommendation. We really do learn something new every day :) I don't do bodice rippers and I thought that was all that Harlequin published. WRONG! I thought this about Harlequin too! I wonder if they know that they have this image. This sounds great, though. I do love books that I can't put down! The cover on this one is lovely, too. I am so glad you liked it, phew. I agree, this book keeps you turning the pages to find out what happens next! I couldn't wait to get to the end. At the same time I didn't WANT it to end, lol. Thanks again Erin!! I hadn't heard of this one but it sounds really good. Great review! Thanks Shan :) This one doesn't come out until June. I have a feeling you'll be hearing about it more then. The Mourning Hours sounds great. Cool that your home state is the setting. What a cool cover! I'm looking forward to checking this one out - it sounds really good! If I saw this in a bookshop I doubt I would be able to keep my hands off it - such a brilliant cover! Pushing my shallow tendencies aside, it sounds like a really good read too. Oh I know, I know. Don't judge a book by it's cover and all that...but how can you help it? This one is fab isn't it? Thanks for visiting Ellie! I hadn't heard of this book until you're wonderful review. The cover, as well as the blurb, are both pulling me. I may just have to get my hands on this one at some point. Thanks Jade :) I hope you do seek this one out, it's lovely! I really enjoyed this book, too! Your thoughts are spot on - so suspenseful! I thought Kirsten provided the perfect point of view to tell this story. It's different than anything I've read before, and I thought it was fantastic. Thanks Kristyn! I really enjoyed this one. A lot! The fact that it's set in Wisconsin is a bonus too ;) Thanks for visiting, I'm going to have to check out your review!